Dressing up and feeling good about oneself while undergoing cancer treatments is a key component to keeping self esteem and motiviation high. Not every day will you feel up to the challenge, but there will be days when you need to get out, feel ‘normal’, and look the best you can. Turquoise – a master healing stone helps protect and align the chakras which in turn strengthens the overall body. Definitely a bonus when going through cancer. Agate – helps to remove blockages from the body and thereby create balance. Whatever one can do to create positive and vibrant energy in the body while undergoing cancer treatment will be beneficial. It might as well be something this is also fun, fashionable and easy to wear as in healing gemstone jewelry. One of the side effects of cancer treatment is lack of energy and absolute fatigue. This fatigue together with the stress of treatment and lack of sleep can seriously undermine our peace of mind. Wearing healing gemstones in attractive ways – such as jewelry – can greatly enhance our energy flow by tapping into the healing vibrations of the earth emitted through these gemstones. Garnet: the ‘Stone of Health’ – helps get rid of emotional blockages, promotes the flow of chi and energy in our body. Citrine: the ‘Stone of Happiness’ filling the energy flow around our body with positive vibration bringing light and optimism. This energy helps alleviate depression – often present with low energy and the stress of cancer treatment. Turquoise: the ‘Master Healing Stone’ brings its energy to help strengthen the entire body which is so necessary to healing from cancer. Healing gemstones in the form of jewelry – necklaces, bracelets, earrings – can be a positive gift for someone going through cancer. A different idea that can bring them energy and a sense of positive at a time when they need it the most. Explore the different gemstones – they are numerous and offer many healing properties. Crystals and gemstones have been used for their healing properties by many cultures for centuries. Alternative healers continue to use crystals and gemstones to restore, balance, and improve a body’s energy. Those who are skeptical as to how a stone can help heal the body should consider that gemstones are used in many aspects of technologies, such as lasers and computers. It stands to reason that if a gemstone can be used for energy in technology it can also be a source of energy for the body. Different healing gemstones have different qualities. For instance, tourmaline is thought to regulate cancer and hormones, as well as dispel fear, negativity and grief. Amethyst facilitates healing and inner peace. Emeralds deal with radiation toxicity and also aid healing and patience. Turquoise is considered the master healer; it protects against environmental pollutants, guards against all disease, improves nutrient absorption, and can subtly realign the body. Whether you believe in the healing properties of gemstones or not, at bare minimum it will serve as a beautiful pick-me-up. What a perfect gift, especially for someone coping with cancer – whether it is the patient or the caregiver. 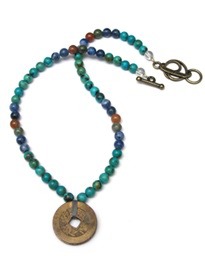 A necklace or bracelet of healing gemstones will provide energy and help balance stress. It is also a wonderful fashion accessory and can be a conversation piece. Clear Quartz – brings clarity, light and healing to our energy field and helps us reach a higher state of spiritual awareness. Laboradorite – helps uncover untruthful belief patterns that no longer serve us. At Christmas time, even amid the more commercial aspect of the season, most of us like to take time to reflect on what is important in life. This can be a return to the spiritual whatever your faith. Why not choose healing gemstones that bring us in touch with this priceless aspect of living – our inner soul. Cancer affects men as well. Prostate cancer being the most prevalent followed by lung cancer. Since men are not as open to showing emotions in public, they need ways to subtley recharge and receive healing energy. One of these ways is through healing gemstones worn as jewelry (necklaces, rings, bracelets). There are many ways to use healing gemstones – some people carry them in a leather pouch. Some place them near them on a desk or table where they can be easily picked up and held. Choices – healing – always moving towards wellness. Health: Can it be enhanced with Gemstones? Gemstones have been with us for centuries and have long been known to emit energy. Different circumstances in our lives can be enhanced by wearing these gemstones close to us, as in jewellery. 1. Turquoise – the master healer, protects and aligns the chakras thereby strengthening the body overall. Jewellery is beautiful and so easy to wear to lift an outfit out of the ordinary into something very chic and special. At times when life is in turmoil and we may not feel at our best, wearing healing gemstones as jewellery can definitely created an added health bonus. Interesting information about the power and beauty of healing gemstones. Love what this wellness consultant has to say about gemstones. Going through a cancer journey, one can use all the help one can get. Healing gemstones will provide not only healing power, but also make you feel beautiful. Buy one, or two , stunning jewelry pieces (necklace, pendant, earrings, ring) to empower yourself. You are definitely worth it. Jewellery, especially earrings, along with makeup, create a healthy glow and focus attention to wellness and healing during cancer treatment – a little “bling” to perk up the day. One such stone is garnet. Garnet is a stone of health and energy. It is a lucky stone for love, success and popularity. Helps to move the chi and energy flow in the body and stimulates physical activity. Garnet is known as the “stone of health” because it dissolves emotional blockages in the body. There are many healing gemstones to choose from according to the benefit you wish to receive. If you like jewellery, necklaces, pendants, rings, etc., all offer healing options. They definitely add something extra at a time when you need a lift. Much has been said about healing energy and how it is used in several complementary therapies. Think about Reiki, Healing Touch, Acupuncture, BodyTalk, etc. Not everyone is aware that gemstones have healing components. Some people carry these healing gemstones and/or crystals in a pouch. Others wear them in fashion jewellery to not only make a statement, but also to derive the benefit from the gems themselves. Gems that are noted for healing are agate, garnet, jasper (red), peridot, and turquoise. Look for combinations of gems that will create whatever you need in your life at the moment. It could be energy as we all know that fatigue is one of the side effects of cancer treatment. Other options are deflecting negative energy, opening blockages, hightening spirituality, creating calmness and peace. It is fun learning about the different attributes of these beautiful gems. 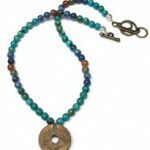 Plus who wouldn’t feel great wearing healing gemstones that are absolutely stunning. What a conversation piece!